Whispers in the Loggia: The Ordinariate's "Supreme Law"
Two days after his ordination to the Catholic priesthood -- and, with it, his papal appointment as head of the groundbreaking Personal Ordinariate for former Anglicans in England and Wales -- Fr Keith Newton (left) held a press briefing yesterday on the new structure, whose 14-month trajectory from Vatican plan to ecclesial reality remains fairly breathtaking by Roman standards. Reflecting both his prior life as an Anglican bishop and his new status as the leader of an entity with the juridical status of a diocese (including financial votes in the episcopal conference), in keeping with the special provision of Anglicanorum coetibus for prelates-become-priests, the new cleric donned a pectoral cross and -- in another first-of-its-kind moment (at least, this side of Canterbury... not to mention Milingo) -- an episcopal ring on his right hand alongside the wedding ring on his left. What's more, though, as the founding set-up is expected to serve as the canonical model for the subsequent Ordinariates to be formed over the coming months in Canada, Australia and the US -- the latter likely to be the largest -- the more canonically-minded might appreciate seeing the full text of the Decree establishing the community as a particular church, issued Saturday by the Congregation for the Doctrine of the Faith and released yesterday. The supreme law of the Church is the salvation of souls. As such, throughout its history, the Church has always found the pastoral and juridical means to care for the good of the faithful. With the Apostolic Constitution Anglicanorum coetibus, promulgated on 4 November 2009, the Holy Father, Pope Benedict XVI, provided for the establishment of Personal ordinariates through which Anglican faithful may enter, even in a corporate manner, into full communion with the Catholic Church. On the same date, the Congregation for the Doctrine of the Faith published Complementary Norms relating to such Ordinariates. the Personal Ordinariate of Our Lady of Walsingham within the territory of the Episcopal Conference of England and Wales. 1. The Personal Ordinariate of Our Lady of Walsingham ipso iure possesses juridic personality and is juridically equivalent to a diocese. It includes those faithful ,of every category and state of life, who originally having beloned to the Anglican Communion, are now in full communion with the Catholic Church, or who have received the sacraments of initiation within the jurisdiction of the ordinariate itself or who are received into it because they are part of a family belonging to the Ordinariate. 2. The faithful of the personal Ordinariate of Our Lady of Walsingham are entrusted to the pastoral care of the Personal Ordinary, who, once named by the Roman Pontiff, possesses all the faculties and is held to all the obligations, specified in the Apostolic Constitution Anglicanorum coetibus and the Complementary Norms as well as in those matters determined subsequently by the Congregation for the Doctrine of the Faith, on request both of the Ordinary, having heard the Governing Council of the Ordinariate, and of the Episcopal Conference of England and Wales. 3. The Anglican faithful who wish to be received into full communion with the Catholic Church through the Ordinariate must manifest this desire in writing. There is to be a programme of catechetical formation for these faithful, lasting for a congruent time, and with content established by the Ordinary in agreement with the Congregation for the Doctrine of the Faith so that the faithful are able to adhere fully to the doctrinal content of the Catechism of the Catholic Church, and, therefore, make the profession of faith. 4. For candidates for ordination, who previously were ministers in the Anglican Communion, there is to be a specific programme of theological formation, as well as spiritual and pastoral preparation, prior to ordination in the Catholic Church, according to what will be established by the Ordinary in agreement with the Congregation for the Doctrine of the Faith and in consultation with the Episcopal Conference of England and Wales. 5. For a cleric not incardinated in the Personal Ordinariate of Our Lady of Walsingham to assist at a marriage of the faithful belonging to the Ordinariate, he must receive the faculty from the Ordinary or the pastor of the personal parish to which the faithful belong. 7. 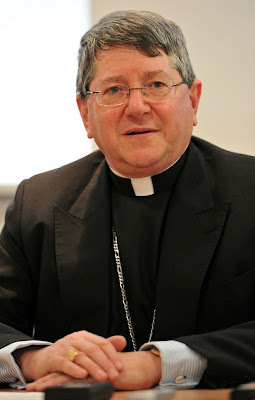 A cleric, having come originally from the Anglican Communion, who has already been ordained in the Catholic Church and incardinated in a Diocese, is able to be incardinated in the Ordinariate in accord with the norm of can. 267 CIC. 8. Until the Personal Ordinariate of Our Lady of Walsingham may have established its own Tribunal, the judicial cases of its faithful are referred to the Tribunal of the Diocese in which one of the parties has a domicile, while taking into account, however, the different titles of competence established in cann.1408-1414 and 1673 CIC. 9. The faithful of the Personal Ordinariate of Our Lady of Walsingham who are, temporarily or permanently, outside the territory of the Episcopal Conference of England and Wales, while remaining members of the Ordinariate, are bound by universal law and those particular laws of the territory where they find themselves. 10. If a member of the faithful moves permanently into a place where another Personal Ordinariate has been erected, he is able, on his own request, to be received into it. The new Ordinary is bound to inform the original Personal Ordinariate of the reception. If a member of the faithful wishes to leave the Ordinariate, he must make such a decision known to his own Ordinary. He automatically becomes a member of the Diocese where he resides. In this case, the Ordinary will ensure that the Diocesan Bishop is informed. 11. The Ordinary, keeping in mind the Ratio fundamentalis institutionis sacerdotalis and the Programme of Priestly Formation of the Episcopal Conference of England and Wales, is to prepare a Programme of Priestly Formation for the seminarians of the Ordinariate which must be approved by the Apsotolic See. 12. The Ordinary will ensure that the Statutes of the Governing Council and the Pastoral Council, which are subject to his approval, are drawn up. 13. The location of the principal Church of the Personal Ordinariate of Our Lady of Walsingham will be determined by the Ordinary in agreement with the Congregation for the Doctrine of the Faith and in consultation with the Episcopal Conference of England and Wales. Likewise, the Seat of the Ordinariate, where the register referred to in Art. 5 § 1 of the Complementary Norms will be kept, will be determined in the same way. 14. The Personal Ordinariate of Our Lady of Walsingham has as its patron Blessed John Henry Newman. Everything to the contrary notwithstanding.